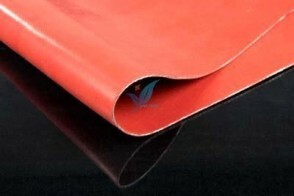 Silicone coated fiberglass fabric is a fiberglass cloth, which possesses the properties of temperature resistance, anti-corrosion, high strength and is coated with organic silicone rubber. The products are made of fine fiberglass with excellent capacity of high temperature and corrosion resistance, coated and rolled with silicone rubber, which is a brand new product with good performance and multiple applications. 1) Electric insulation: Silicon rubber coated fiberglass cloth features high grade of electric insulation and bear a load of high voltage. It fits for making products like insulation cloth and sleeves etc. 2) Non-metallic compensator: used as pipeline flexible coupling, non-metallic compensator helps to avoid damage caused by heat expansion and cold contraction. This membrane material specially fit for use in industries of petroleum, chemical engineering, cement, iron and steel and energy sources due to its special features of temperature resistance, anti-corrosion, anti-aging, and good elasticity and toughness. 3) Anti-corrosion sector: It is good to be used as inner and outer anti-corrosion layer featuring excellent corrosion resistance, temperature resistance and high strength. It proves to be an ideal anti-corrosion material. 4) Others: Apart from above application, it can also be used as sealing material, temperature resistant and anti-corrosion conveyer belt and packaging material. Our engineers conduct research and development activities regularly and gives emphasis to the development of ways to manufacture more efficiently which help reduce costs, improve quality and match individual requirements.